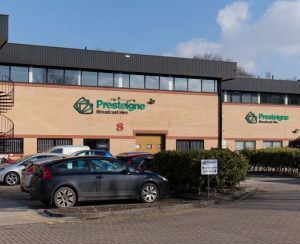 Presteigne Broadcast Hire has announced that it has made another multi-million pound investment in hire stock and taken on an additional 21,000 square feet of warehouse, service and operations space. The result is that it has nearly doubled its physical footprint in order to meet demand for its products and services. Presteigne already maintains more than £2m in hire stock from the likes of Sony, Canon, Cartoni, Blackmagic Design, Vinten, Sachtler, Leader, and many others, but it has now added 33 Canon CJ12 lenses, 64 new HD/4K Sony Z450 camcorders, Leader test kit, 34 Vinten tripods and new Cartoni tripods – which will usher Presteigne into the cinematic world – plus new lighting options and a substantial range of additional broadcast technologies. As part of its physical expansion, Presteigne has installed a designated, soundproof audio room for design, testing and maintenance and noise reduction technologies – both existing and in development.